The approach used below comes from fastai's Deep Learning MOOC (Part 2). The following lines of code are directly copied from the last exercise to make this post functional on it's own. CSV and BB_CSV correspond to classification and localization data files respectively (same as last time). x in training data is the same as before, but we need to provide both classes and bounding boxes as part of y. Architecture as to be tweaked to handle both tasks. Appropriate loss function has to be chosen to train the model. 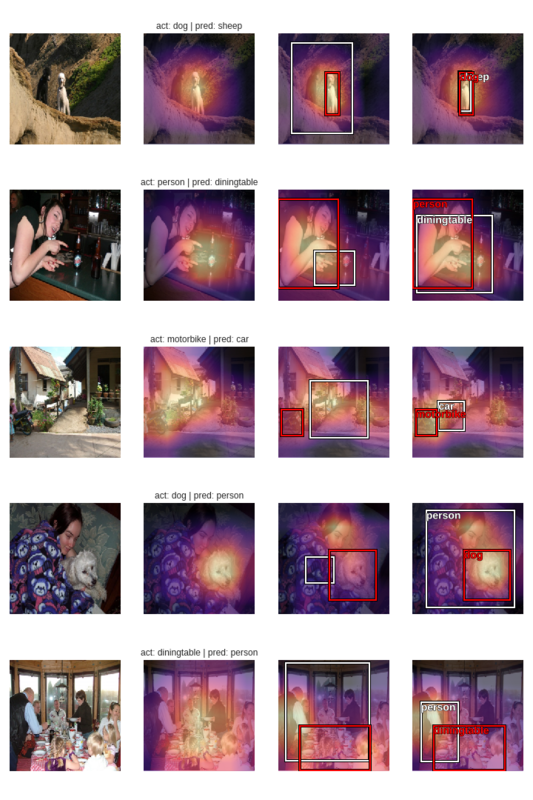 We need to combine the datasets of the two models seen before: largest object classifier and largest object localizer. We do this using fastai's Dataset class which lets us override the __getitem__ method. 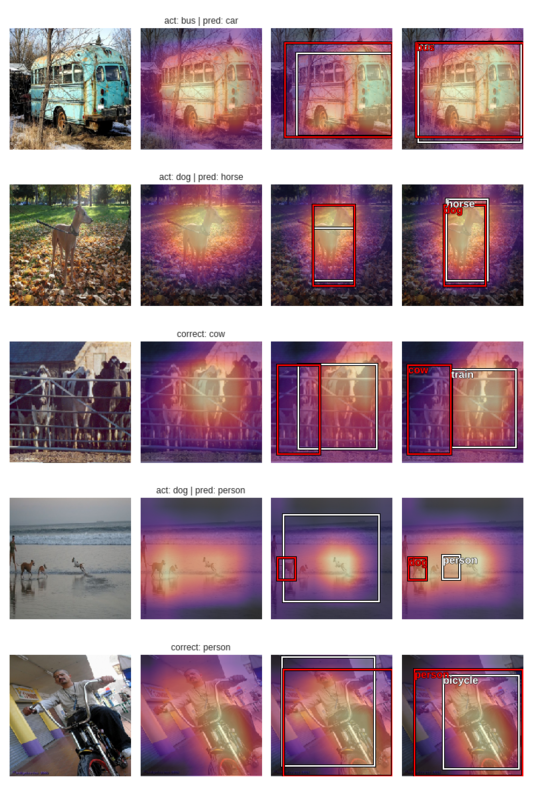 We'll combine the two ImageClassifierData objects used before and create a custom dataset that returns (x,y) where x is the image tensor same as before, but y is a tuple containing bounding box as well as class. Let's see one y entry in this custom dataset. As expected, it is of the form (bounding box coordinates, class). It's time to think about the output of this model. The easiest approach is to simply concatenate the outputs of the previous two models, ie, 4 activations for a bounding box, and a number of classes activations for classification. We'll add one more linear layer to the custom head this time, with ReLU, Dropout, and BatchNorm where appropriate. Here's the custom head we added to the backbone. In order to make it easier for the model to converge, we scale the bounding box predictions to fit in the range of (0,224) (224 being the dimension of the image) by first performing a sigmoid (which scales it to (0,1)), and then multiplying by 224. Also, the cross-entropy loss is multiplied by a factor (20 in this case) to bring the two losses on the same scale. We can also write custom loss metrics for each task. These will show up during training. Getting similar metrics as before for both tasks, ie, around 80% accuracy for classification, and L1 loss of about 18 for localization. 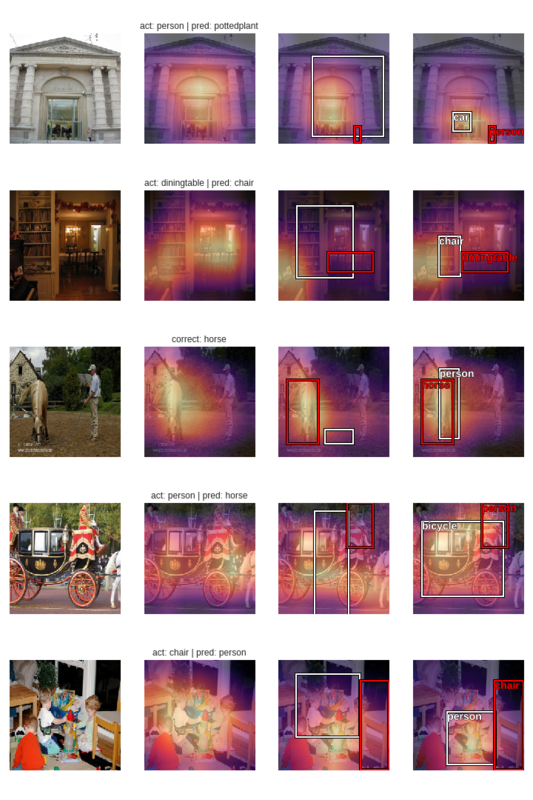 One takeaway here is that the computation performed by the convnet to find "which" is the largest object in the image is shared with that to find "where" is this object. Earlier the largest object classifier and largest object localizer were working in isolation, but here it's a single network performing both tasks. 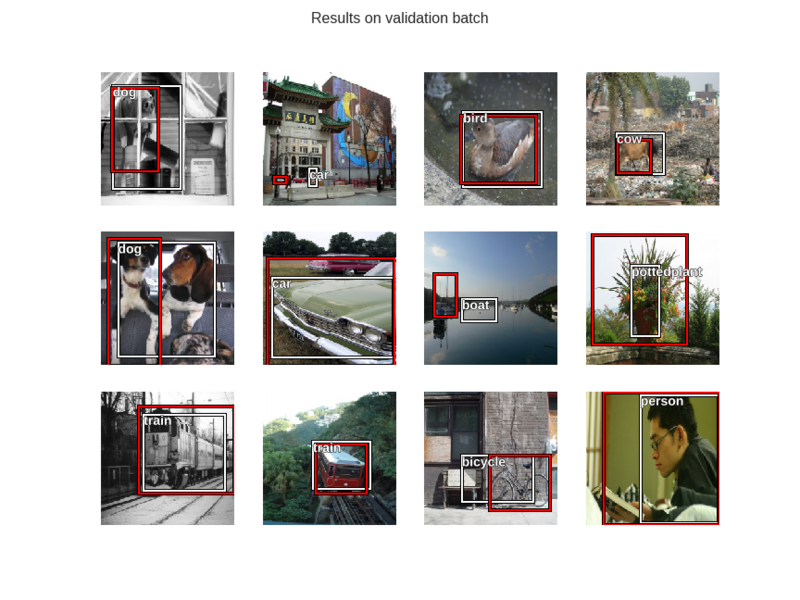 Let's check out the results on validation set. The white bounding boxes and text correspond to predictions, and the red ones correspond to the ground truth. Multiple labels are shown only when the model mis-classifies the largest object. Now that we have models for all three stages, let's compare heat-maps from forward activations for all of them. White boxes and labels are predictions, while the same in red is ground truth. 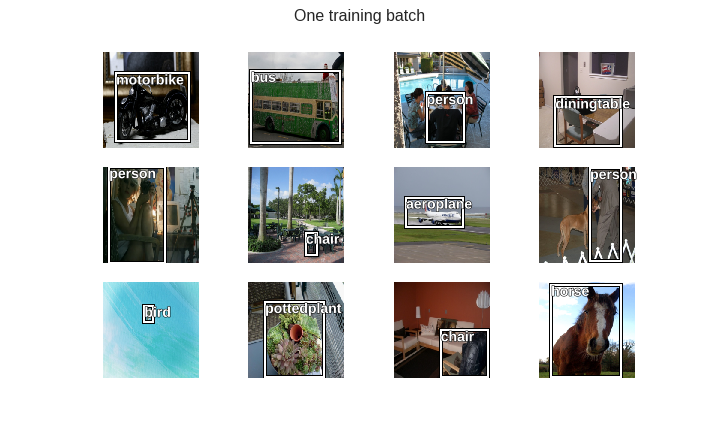 Since posting a whole bunch of images on the blog isn't feasible, I've run these experiments on a much bigger set here and here. These notebooks are quite big in size so I recommend viewing them on nbviewer. It seems that combining both tasks in a single network has mildly modified the behaviour of both tasks individually. Also, the heat-maps for stage 2 and stage 3 are almost similar, but the bounding boxes in stage 3 seem to be quite different than those in stage 2. The model is obviously performing poorly on images containing more than one clearly visible objects. 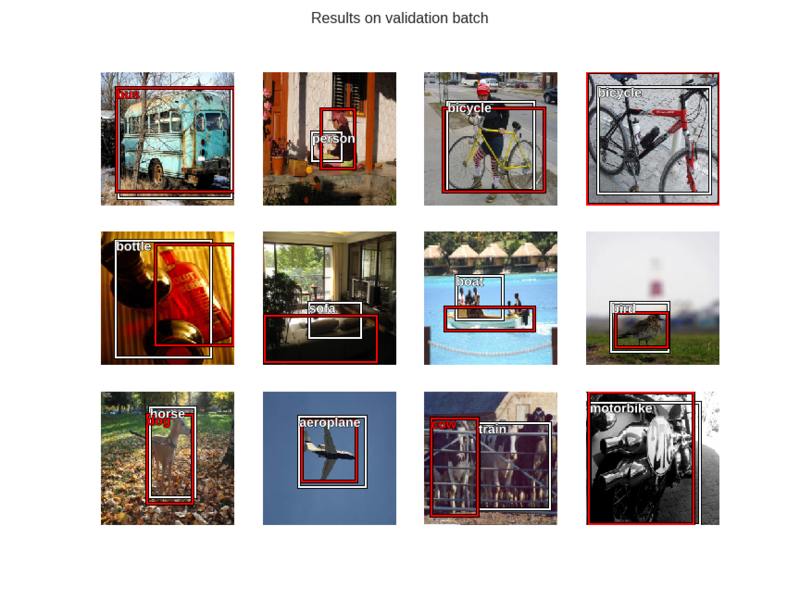 This concludes single object detection. 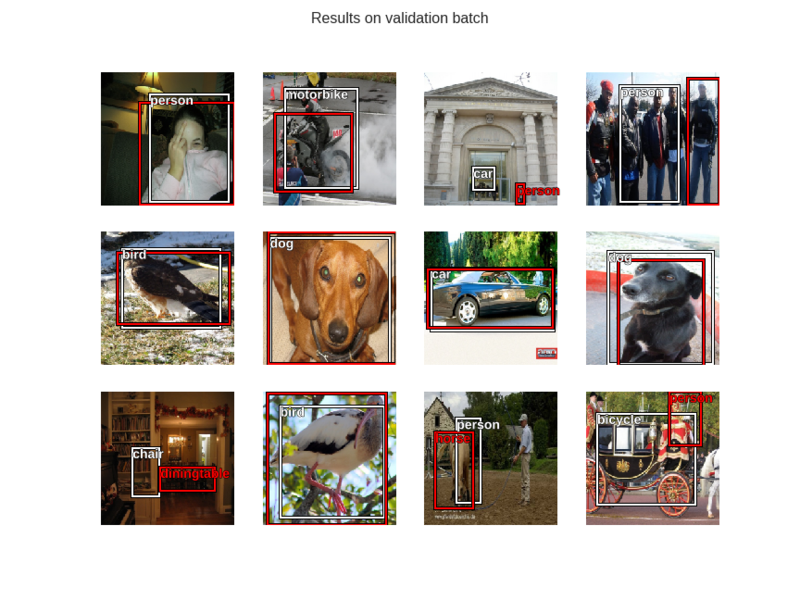 I'll resume this exploration with multiple objects detection in upcoming posts.